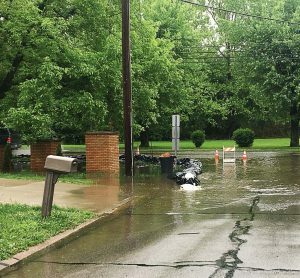 When the rains began to pummel much of the Central U.S. in late April and early May, community leaders in Missouri knew it was no ordinary spring shower. Within days, over 12 inches of precipitation fell and tornadoes twisted across the state causing rivers to rise, trees to topple and power to peter out. According to reports, 369 homes were destroyed while another 848 sustained major damage. With losses totaling an estimated $86 million in the disaster area and cleanup efforts expected to continue throughout the summer, municipalities are reevaluating their public safety plans and looking to get ahead of the next storm. City of Arnold Police Chief Robert Shockey said the key to mitigating damage during a flood event and keeping the public safe is having a solid emergency preparedness plan in place and being ready to execute that plan when and if the time comes. Shockey opened the Emergency Operations Center on April 30 and alerted the public that the Meramec River was expected to crest at 44.5 feet at approximately 7 p.m. on Wednesday, May 3. He then began putting sandbags in place with the help of some National Guard Units who happened to be in the area. Throughout the following days, he kept the public informed of any new developments, cancellations, road closures and possible power outages via the city’s website and Facebook page while letting citizens know where they could turn for help in the event they needed it. He said drawing on the experiences of the past helps him be more prepared for the future. Likewise, the city of Cape Girardeau was prepared for the flood by filling sandbags and monitoring the levee system it put in place after similar events in the ’50s and ’60s. Though it was not a popular decision at the time, the community leaders determined that they were necessary in order to protect the public and hold back the water anytime the Mississippi River began to rise. The levees have been added to and reinforced over the years, most notably after the 1993 flood and city manager Scott Meyer said they have been very effective in keeping flood waters from encroaching on the historic riverfront. “I’m sure it was difficult for the residents who lived in the flood prone areas to sell their homes to the city at the time and I know there was a lot of opposition to it, but both the buyouts and the construction of the levee system were smart investments for the city rather than spending millions in subsequent years repairing the damage caused by occasional floods like this,” he said. During the May event, Meyer said employees of the Cape Girardeau Public Works Department checked on the levee wall up to six times a day to ensure that it was structurally sound as 8.2 million gallons of water flowed by per second during the height of the storm. Some areas with levees were not as fortunate. Across the state at least seven levees were topped by water while another seven were breached. Most of these walls were located in rural areas where the impact was primarily on farmland. There has been some criticism by the Army Corps of Engineers in the Rock Island District that at least 40 percent of the levees north of St. Louis have been overbuilt and caused problems down river, but it is unclear as to what affect, if any, this had on the May event. Meyer said not every river town requires a wall, but if community leaders think one may be necessary for future floods, it may be wise to build one now rather than later. “The best advice we could give another area is to look at the longterm impact of the flooding, make the investment ahead of time and look for opportunities to rethink the area in the event you need one. Some communities see a wall as a barrier that blocks their view of the river, but others see it as a blank canvas that allows us to incorporate art while still giving them access to the water.” Ultimately, municipalities have to protect the public, and whether that means buying out homes that are in obvious flood zones in order to put up a wall or creating a comprehensive emergency action plan so that the community knows where to go and what to do, it is important for cities to create those strategies now rather than waiting until it is too late. “It sure seems like recently, the floods have been larger and they have come on a more frequent basis. For us the levee has been effective because when you have a good sized event every couple of years, it sure seems like we need it,” he said.